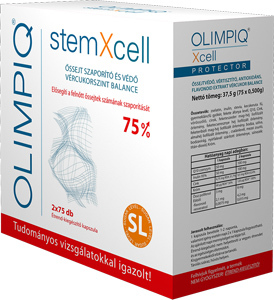 Olimpiq StemXCell SL75% 75 pcs. - 75 pcs. Active ingredients of Olimpiq SL are natural substances which are undoubtedly important in diabetic people's life quality improvement, by providing well-balanced blood-sugar levels for them. Besides we can achieve protection from complications of both types of diabetes by improving regenerative capabilities of the body and in fighting complications as well. Stem-cells are able to convert and differentiate into insulin-producing cells in the body. Insulin facilitates sugar get into the cells, so its concentration in the blood will lower. Blood-sugar level will be altered. Mutation of stem-cells is influenced by many circumstances. Some substances only cause formation of certain targetted cells. Adult stem-cells provide regeneration of the body. Only stem-cells are able to mutate into any other healthy cell. Complications of consolidated hyperglycaemia and diabetes show that the given organs and cells get damaged. This is the very state when the body would need more stem-cells. It is a type of diabetes ocurring less frequently and forming mainly in infancy or adolescence. It is usuallay caused by an autoimmune processes destroying insulin-producing beta-cells of the pancreas in genetically inclined people. Following this, the patient will only be able to be kept alive by administering insulin injections. Nowadays approximately 40-50 thousand people live in Hungary suffering from diabetes type 1, 2,600 among them are children under 14. This is a more frequent type of diabetes, occurring mainly to genetically inclined people, due to their life-style problems. It is mostly caused by overfeeding, the lack of movement, lowered phyisical activities and obesity as a consequence of all this, plus insulin resistency developing following it. As these harmful factors are more and more often met, even in early childhood, it isn't rare to see young people in their twenties with diabetes type 2. The number of people with diabetes type 2 in Hungary is approximately 500-600 thousand. Chromium is a trace mineral necessary to normal glucose, insulin, fatty acid and protein metabolism and muscular development. The proper chrome intake, absorption and assimilation is needed to regulate blood-sugar levels, formation and normalization of insulin-sensitivity. When it is lacking, insulin.resistance will take place. Zinc plays an important role in the treatment of the disease, as insulin is stored in the pancreas by binding to zinc, it is indispensable to its function and essential to wound-healing, which is extremely important in case of diabetic people. According to studies Stevia is a promising medication in case of diabetes type 2. It mitigates insulin-dependancy. It supports the functions of the pancreas which has got an outstanding role in producing enzymes with a key-role in carbon hydrate decomposition. It is also determinant in supporting glucose metabolism of the liver. Blood-sugar level is controlled this way in the body. Goat's rue is well-known in popular medicine as a plant with blood-sugar lowering properties. Its active ingredients are alcaloids, flavonoids, saponine, amara. It stimulates carbon-hydrate metabolism. Dandelion: stimulates liver and biliary functions and lowers blood-sugar levels. It is important in the prevention of cardiovascular complications or retinopathy caused by diabetes. Its active agents: flavonoids, triterpene, amara, taraxacine, inulin, vitamin D, with significant amounts of vitamins C, A and B in its leaves and saponin in its roots, plus the entire plant contains high amounts of potassium. Whortleberry leaves: strengthen vein-walls, first of all in capillaries. They are especially useful in treating diabetic retinopathy or maculotrophy (atrophy of the corpus luteus or macula lutea). Based on examinations performed until now it can be stated that significant improvement can be achieved in the retina and inside it the macula which is responsible for sharp sight, by improving circulation. Due to the capillary-improving effect, it is promising in the treatment of diabetic nephropathy because of its regenerating impact on the capillaries of the kidney, parallel to the capillaries of the eyes. Coenzyme Q10 plays an important role in providing energy-economy of the system by its cellular metabolism support. It strengthens regeneration of the tissues at night. It enables people to lose weight without feeling any hunger, the optimal weight can be achieved this way. Moreover it protects muscles and keeps metabolism at the right level. 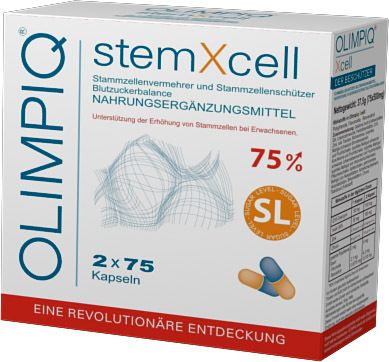 Olimpiq StemXCell 75% 60 pcs. - 60 pcs. 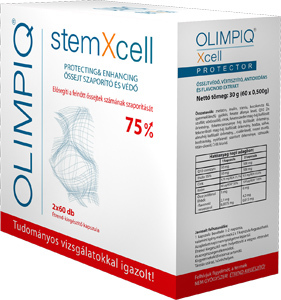 You can have 75% more stem-cells with the help of Olimpiq StemXCell! The best stem-cell therapy is to enhance your own active healthy stem-cells. These cells are known/recognized by the body and they constitute the very base of self-regeneration. The possibility hidden in us! The first 17 surgeries of the past two years were performed on patients with cardiac infarction cases. The implanted stem-cells regenerated the cells of their hearts, cardiac functions have been improved. If every patient with heart disease set up a claim for having such operations, it would take them more than 20 years to wait for and all this would cost 2,000 billion HUF. There are two ways therefore: growing your own stem-cells, the other way is impassable. It can be stated for sure that stem-cells are the „omnipotents” of the body. A promising field of future medicine is that of stem-cells. Medical science has come to the opening of a new age: utilization of stem-cells. One of the most important questions of stem-cell research nowadays is how to propagate adult stem-cells. In case we are able to persuade our body to produce more stem-cells in a natural way, the body itself will be able then to correct the errors occured because of an illness, an accident or simply as a consequence of ageing. The more stem-cells you have the better your state of health is. Bone-marrow stem-cells constitute the natural „renewal” system of the body. Stem-cell level is the best sign of good health. It is better than that of cholesterol, blood-pressure or blood-sugar level. It is better than anything that is knoiwn as a cardiovascular risk factor, and this valid for everything in the body. As regards the number of stem-cells, it might alter between 5 million and 25 million in 5 litres of blood. As we get older the number of stem-cells produced by the body decreases significantly. You can have at least 75% more stem-cells in an hour! A new term. Stem-cell nutrition, stem-cell protection. 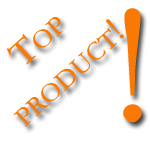 The Olimpiq StemXCell is the first and very unique adult stem-cell propagator with really extraordinary qualities. Stem-cells are unspecialised cells able to reproduce which create cells similar to themselves trough asymmetrical division, besides producing bound descendant cells/offspring. The pro-embryo or homozygote after conception and passing through the oviduct toward the womb and then embedding there, still consists of totipotent cells (suitable to become everything). On the 15th day of embryonal development these cells start to specialise to become neurocytes, cerebral cells, myoblasts, skin-cells, etc. The various stages of genetical material (DNA) initiate their function in these cells and the organs and tissues will become capable of fulfilling their special tasks. However it costs them to lose their totipotent chance. During embryonic development some of these totipontent cells are retained, these are called haemopoetical or tissue stem-cells that can be gained from the navel-string at birth. There are two types of stem-cells: embryionic or adult stem-cells. Adult and embryonic stem-cells have got very similar qualities, but adult stem-cells are more difficult to isolate from the bone-marrow. Stem-cells are present in several tissues of the body in adulthood. Histic or tissue stem-cells are present in continuous multiplicational or dormant state. If these cells get into a given histic environment, they might become able to convert into various mature cells constituting tissues. The biggest quantity of them is found in the bone-marrow. If an organ doesn't function optimally or gets injured somehow needing cell-replacement, it will send a message to the bone-marrow, which in turn, will recognize the information and send back some stem-cells. The stem-cell leaves the bone-marrow, gets into the blood-stream, then arrives at the organs supported by a special messenger substance. When it arrives at the „target area”, makes use of its own division capability and sends a copy of itself, while assimilating into the organ and becoming one of its cells itself. The organ will become able to renew this way, keeping its own functions and go on functioning in a healthy way. 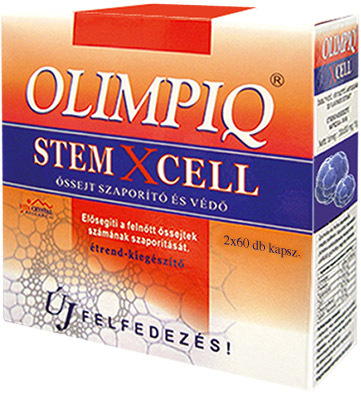 Olimpiq StemXCell 60 pcs. - 60 pcs. It can do everything – co-operating with you! Let's have one common goal: to preserve healthy condition of our body when we can do it by using the minimum energy possible! One of the most important questions of stem-cell research nowadays is how to multiply adult stem-cells. In case we are able to persuade our body to produce more stem-cells in a natural way, it will be able to correct faults occurred because of illnesses, accidents or simply caused by ageing. Olimpiq StemXCell is a new discovery, a new product category in food supplementation! They are produced in the bony marrow and fulfil some basic functions in the regeneration of the organs while circulating in the bloodstream. As ageing proceeds the number of newly generated stem-cells significantly decreases. Application possibilities of stem-cells are multifunctional in the body. It means they can convert themselves or reorganize into any other cell. In case more stem-cells are available in the bloodstream, renovation processes of the body can be enhanced, or functionality of certain organs with decreased functions might be improved. The more stem-cells are present in the blood, the best it is for the body. This is the very phenomenon people start to discover in these days. More stem-cells can support recovery even more. Bone-marrow stem-cells constitute a natural renovation system of the body. Stem-cells are also called „ready-to-do-anything” cells. Following conception – for 14 days – an embryo consists only of stem-cells that are of such „ready-to-do-anything” cells. Beginning from the fifteenth day of its development these cells differentiate and start to form nerve, muscle, bone or skin-cells. However some number of „ready-to-do-anything” cells still remains unchanged. There are two types of stem-cells: embryonic and adult ones. Adult and embryonic stem-cells have got very similar properties, adult stem-cells however are more difficult to isolate from the bone-marrow (separate). There are stem-cells in every organ, but the highest number of them can be found in the bone-marrow! In case an organ does not function optimally, or is injured some way and needs cell-replacement, it sends a message to the bone-marrow, which in turn recognizes the information and sends some stem-cells (to the organ). The stem-cell leaves the bone-marrow, gets into the bloodstream, arrives in the organ, then becomes one of the cells of the given organ. If an organ cannot function optimally, sends a message via a special courier substance to the bone-marrow that will recognize the information and send the necessary stem-cells. These stem-cells have to reach the adequate organ, recognize it, then convert themselves into the right cells of its tissues. When they arrive to the „target area”, they make use of their dividing capacities, sending their own copies further, but they build into the organ becoming some of its cells. The organ will be able to renew this way, preserving its functions and working in a healthy way. The route of the stem-cells in the bloodstream is further ensured while they are saved from attacking free radicals through antioxidants, bioflavonoids. It is important, too, that these stem-cells could get to the place, via the substance helping their circulation where, following their transformation they could become healthy and functional cells of a new heart, skin, bone, muscle, nerve, kidney, liver, lung, cartilage, pancreas or eye. According to researches the higher number the stem-cells are present, the better healing processes and regeneration capacities they mean to us. The new medicine of the millennium: STEM-CELL THERAPY! It has been clinically demonstrated that by increasing the number of stem-cells even the organs incapable of functioning can be restored and regain their original functions. Stem-cells are grown in the bone-marrow and travel through the bloodstream, passing through some complicated biochemical processes to reach the faulty, unfunctioning organs, ready to renew its cells. It is important moreover that these stem-cells could reach the right place, carrying substances that improve circulation, where, following their transformation they could become functional, healthy cells of a new heart, skin, bone, muscle, nerve, kidney, liver, lung, cartilage, pancreas or eye. This is the beginning of the first natural biological revolution of the third millennium. So the future has already begun! Stem-cell level means the best adjective! Correcting and building capacities of the human body alter in childhood, adulthood and old age. The number of stem-cells in 5 litres of blood is between 5 million and 25 million. Stem-cell levels are the best markers to show healthy state of the circulation, blood-pressure, diabetes, etc. They are even better than anything else that is known as cardiovascular risk and is true for everything in the body. The more stem-cells are present in the body, the better your health condition is. According to research of the past centuries it can be stated for sure that stem-cells are the „almighties” of the body! Promotes production of stem-cells in the bone-marrow and the migration of stem-cells from the blood into the tissues. And improves the various functions of the immune system. We can have 50% more stem-cells than before – within an hour! 1. It is not a medication, but its effect has some significance beyond any other produce. One of the most important questions of stem-cell research of today is how to multiply adult stem-cells. If we can persuade our system to produce more stem-cells in a natural way, the body will be able to correct the faults occurred because of an illness, an accident, or simply because of the ageing process. The more stem-cells there are in the blood, the better it is for the body. This is a phenomenon discovered recently. The body can maintain itself, bringing it into the optimal health condition. The more stem-cells we have, the better recovery it will mean. Bone-marrow stem-cells constitute the natural „renewal” system of the body. Adult or tissue stem-cells are generated by the bone-marrow and while circulating in the bloodstream they fulfil a basic function in the regeneration of the organs. By the progress of ageing process the number of the produced stem-cells significantly decreases. Application choices of stem-cells are multifunctional in the body. That is, they can be reorganized and converted into any type of cell. The more stem-cells there are in the bloodstream, the better the renewal process of the system will be enhanced to or, impaired functionality of certain organs might be improved. - Not only some organs, but other tissues, or even bones can be revitalized. - The gel-like substance constituting vertebral disks can be produced with it, too (e.g. disc degeneration). - Pancreas has been produced for more than ten years now. - Vision can be restored by its use. - Successful liver, myocardium (heart muscle) and leukaemia treatments. A new notion: stem-cell nutrition – stem-cell protection. Constituents of material among the hundreds to be examined were selected by our researchers from the ones of all over the world. To preserve healthy condition of the body when we can still do it by using the least possible energy. 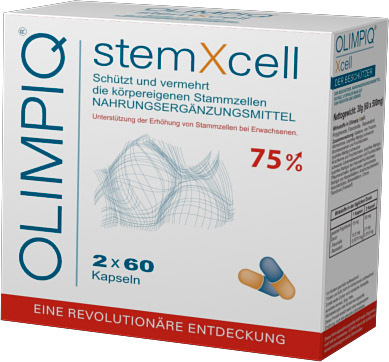 OLIMPIQ StemXCell is a special produce that multiplies the number of adult stem-cells in the body. Let's help our body to regenerate. Bio+Active Broccoli-germ capsules 250 pcs. It is beneficial to bones and teeth, lymphatic glands, it purifies blood, improves blood-circulation and metabolism of cells. Its hydroquino-glycoside content might inhibit tumour formation and its growth. It is mentioned as the most powerful plant in fighting gullet cancer, stomach cancer, colon cancer or rectal cancer, it might have an important role in fighting lung cancer, prostate cancer or bladder cancer as well. - With the biggest quantity of enzymes in it. - Due to its glycose-inolate content it might be a promising formula in cancer treatment. - With significant leaf-green content. - It has a decisive role in exterminating Helicobacter Pylon. - Its calcium content equals to that of milk, therefore it is beneficial to bones, teeth and lymphatic glands. - It purifies blood, improves circulation and metabolism of cells. Storage: in a dry and cool place. Keep out of the reach of children. - According to experiences it supports blood-circulation, enhances blood and oxygen provision of the cells. - Nourishes and develops muscles in a healthy rate, while providing nutriments of the needs of the system. With a special effect on nervous system support. Nerves are embedded in special fat-pads, the so-called myeline-shieth which helps the transfer of impulses get into the brain. Vegetal fat content of spelt strengthens these fat-pads and at the same time the nervous system as well. -Its protein content is 17-20%, which means a multiple value comparing to ordinary wheat, plus its amino acid composition is excellent. - Essential fatty acids – it benefits the nervous system. - Minerals: Fe, Mg, Ca, Co P, Se (iron, magnesium, calcium, cobalt, phosphorus, selenium). - Vitamins (A, B and E). - Due to its selenium content, which is 7-8 times higher than that of other cereals. It is important to underline this fact, because it plays an important antioxidant role in prevention of cancerous diseases. It is recommended to glutene-sensitive people as well because of its different starch and protein composition. - Strengthens the nervous system. - Efficient for instance in fighting Candida infections. - Beneficial to psychological and physical performance and regeneration of smokers. Bio+Active Alfalfa-germ capsules 250 pcs. It helps to maintain acid-alkalic balance of the body, inhibiting formation of gout, mitigating symptoms of arthritis and rheumatic disorders this way. Helps to relieve arthrites or rheumatic disorders. Traditionally only Arab people cultivated alfalfa approximately two thousand years ago. They called it the father of all the nutriments. In peasant medicine it was called the medical food of gout people. Nowadays it is already known that its vegetal estrogen content is important, too. None of the fruits or vegetables contains so many enzymes indispensable to digestion! - Alkalic effect of alfalfa dissolves uric acid from the joints, its ordinary use is a great help in case of arthritis or rheumatic disorder. - Might have a milk-secretion stimulation influence of nursing mothers. - Due to nits succin acid content it helps to maintain flexibility of the connective tissue. Storage: in a dry and cool place, keep out of the reach of children!